What started out as a rather typical morning in our school today quickly spiraled downward. Without going into details, let’s just say within an hour we had tears, yelling, and feelings of failure. The tears and yelling-the kids. The feeling of failure-me. I begged God in the midst to please give me the strength to help my children. I saw them dealing with typical issues of kids. I wanted to scoop them up and fix it. I asked Him to help me fix it. Yet, God doesn’t always want us to fix it right then and there. In fact I think He was placing us right in the midst of this mess because that is exactly where He wanted us. To teach us. A living lesson. Right before all of this happened, we were studying Genesis 2-3, and the fall of man. We had discussed so many things this week about Adam and Eve, the fall, and the curse. We had great conversations, which I felt so very blessed about. Then immediately after our lessons, here we were. A small incident started a downward spiral, just as Adam and Eve’s seemingly small (to them) misstep became the biggest downfall to mankind. We had JUST talked about how our sin can quickly go downward and there are consequences to our behaviors. Even the small sins will have many effects. So here we were in the middle of that very thing. We also had lots of blame. “But it’s your fault!” was heard several times this morning. So yes, again, thank you God for the life lesson. Just as we had talked not 5 minutes before about how quickly Adam blamed Eve for his sin, it was happening before my very eyes. As the morning went on, it got worse before it got better. But then, there we were right back where we should have been In the Word. 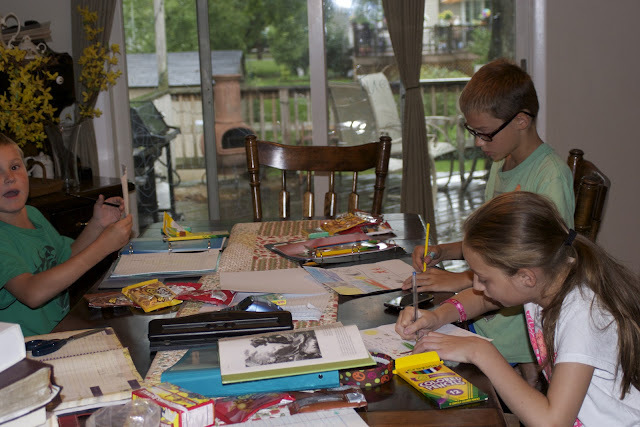 I had asked the kids to read certain passages pertaining to what was happening in our home. And in our hearts. Truth is, we need to walk through the fire sometimes, in order to get closer to Him. He turned my failure into good today. He shows us so many times His goodness, and in the midst of this trial He didn’t let us down. He taught us a lesson in so many things. Aside from all that, we did have several highlights this week. We had amazing discussions about the Bible passages we were in, and we also learned many facts about the possible location of the Garden of Eden. They each made a family tree for our family when we talked about the generations of Adam as well. The preschooler is busy practicing his letters. 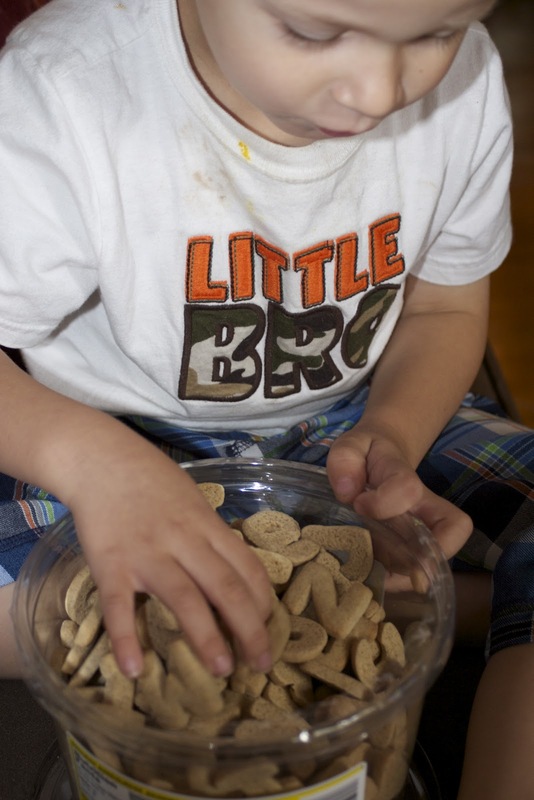 Today I gave him ABC cookies, but he could only eat the “A’s and the B’s” which were the letters of the week. 🙂 He looked so intently to find those letters! 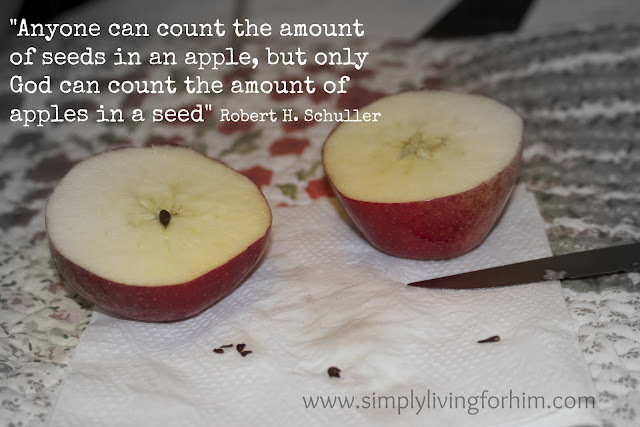 Anyone can count the seeds in an apple, but only God can count the number of apples in a seed.” Robert Shuller. We talked about how Adam and Eve were the first people and all have descended from them. We talked about how their sin caused all of mankind’s sinful nature 6,000 years later. How only God knows the outcome and how everything we do has a consequence, seen or unseen. We talked about how we do not know the potential in each of us, and God has a plan for our future. So another week in the Bible is under our belts, and while the lessons learned were hard, the end result is always best! Next week we move into the generations of Noah and then into Noah and the ark. It may take us two weeks, we will see. I have assigned the middle schooler a power point project and want to keep her busy with that. We have also joined the Institue for Cultural Communicators, which is a public speaking group. I saw God’s amazing work already in a nine year old who was in tears at the beginning of the first session (he is very shy), to loving the class and even volunteering for activities and speaking at the end. Praise God! Meanwhile, we are letting God lead us in all…keeping our eyes on Him and not on what other’s are doing or think. He is the only one I answer to at the end of the day, and I have become much more confident in what I am doing. To Him be all the glory!